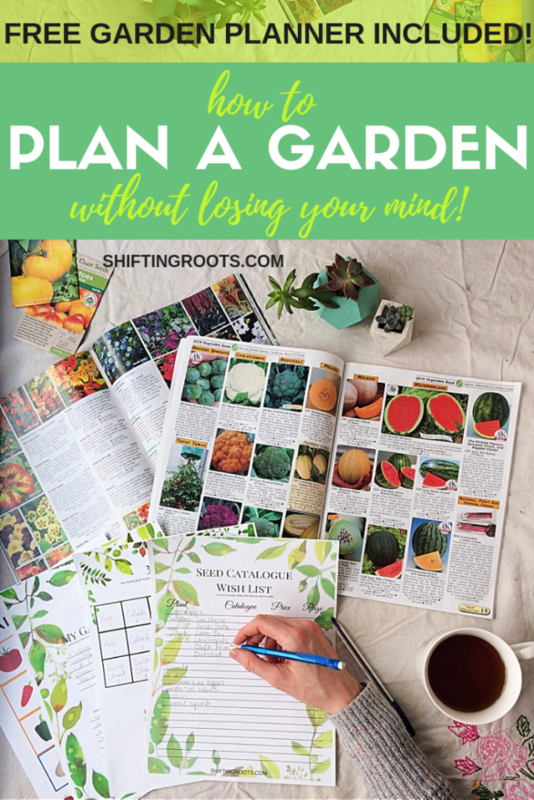 Planning a garden, but you have a million ideas swirling through your head? Wish you would have had someplace to write down what worked and what didn’t last year. . . and now you forget? and finally, do you wish that something useful could also be pretty? 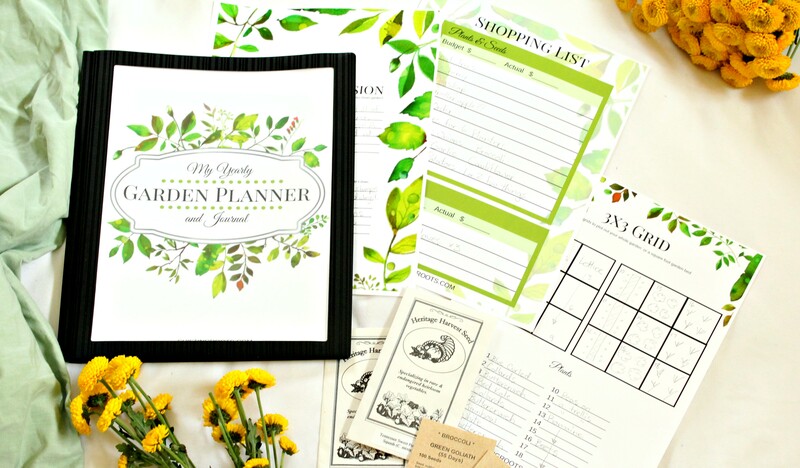 You need this 28 page free printable, downloadable garden planner! 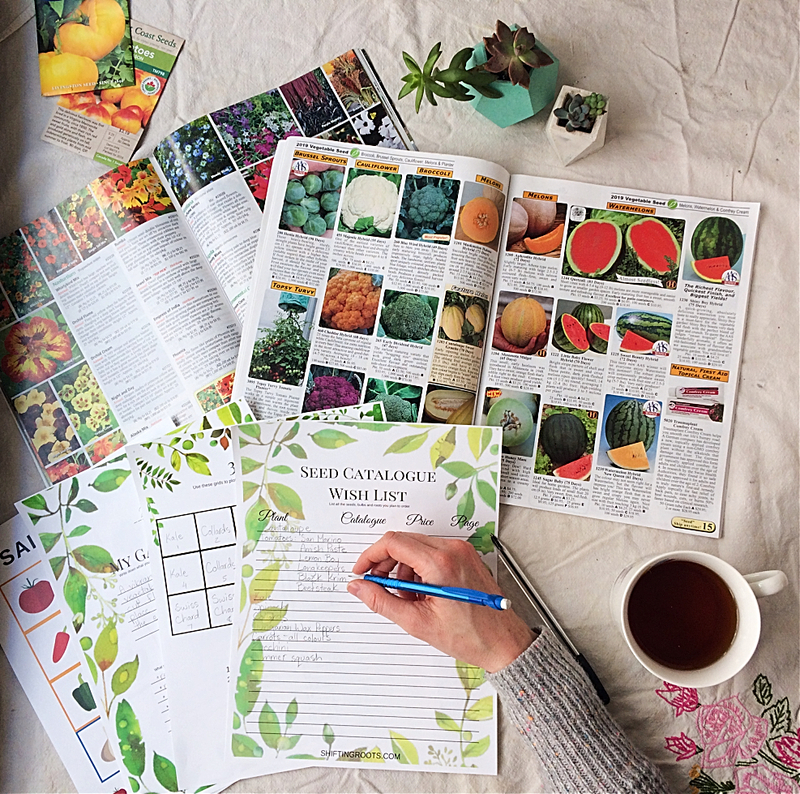 Enter your email below to get your free Garden planner! Checklists, organizers, and trackers so you don't forget a thing. Weekly and daily journalling pages so you can easily keep track of the weather and what you did when. Space to reflect on what worked and what didn't so you can make next year's garden even better!! Peace of mind knowing everything is planned out and organized! Ready to plan out your best garden yet? Enter your details below to download the free Garden Planner and receive the Shifting Roots weekly newsletter, full of gardening tips, real-world advice, and inspiration for your garden. It may still be the dead of winter, but it’s never too early to start planning out your garden for the Spring! But planning your first garden can quickly become overwhelming. Should you buy from seed catalogues or at the store? Are you planting vegetables, flowers, herbs, or all three? Where are you going to put everything? What is the best bean for your needs out of the 30 the seed catalogue is offering? Here’s 10 questions to ask yourself so you can get some clarity around your garden and start planning without losing your mind. How do I start a garden plan? 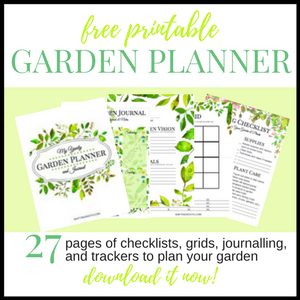 Before you ask yourself these questions, download my free garden planner so you have a convenient place to write down your answers and draw out your plans. 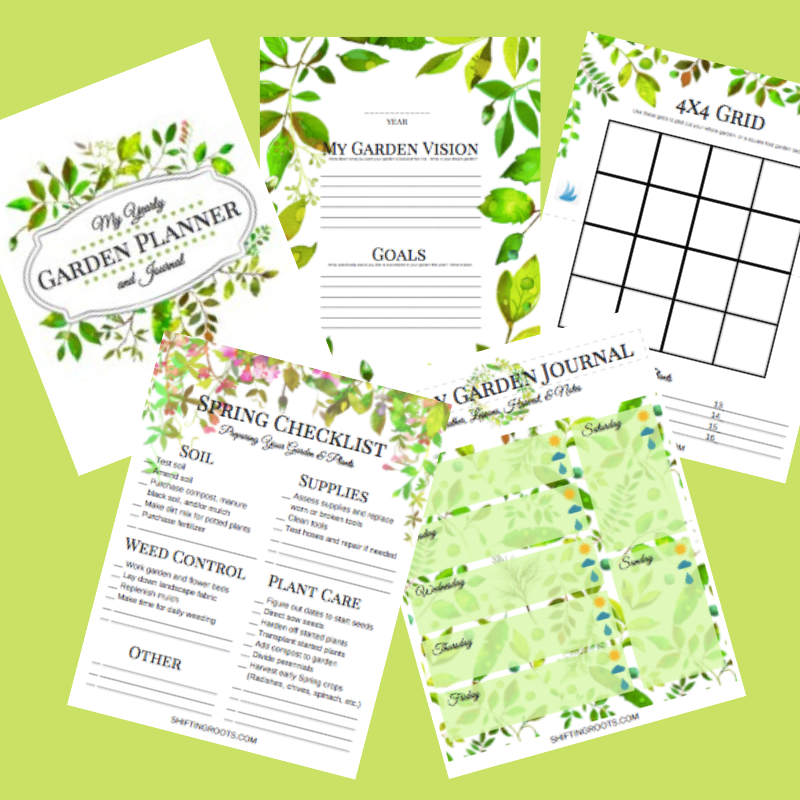 Get your free Garden Planner and worksheets and start creating the garden of your dreams. Don’t be overwhelmed by all 28 pages. You won’t use every single page. In fact, you might not even use some of the pages the way I intended–and that’s okay. Just print out the ones that make the most sense to you. Now that you’ve got that printed out, let’s walk you through. 1. What do I want out of my garden? Do you want to cut down your family’s food bill? Are you hoping to have cut flowers to decorate your house all summer? Or do you just want to prove to yourself that you can keep something alive? There’s no right or wrong answer. In my first year of growing a garden on my own, I just wanted to prove to myself that I could grow food without my parents help for as cheaply as possible. Last year my goal was to use the square foot gardening method to maximize my urban garden space. This year, my goal is to experiment with companion planting in the vegetable garden, and to create a small-scale annual cut flower garden. Maybe you just want to grow a few fresh herbs and a patio tomato for cooking. Maybe you want to try and extend your short growing season. Whatever your goals, write them down on the goal page. This will help keep you focused as we go through the rest of the questions. Side note: If this is your very first garden, avoid trying to do everything in your first year. Whatever size you think your garden should be, cut it in half. Have a few gardens under your belt? Go wild. 2. What are my growing zone and frost dates? Next, you need to know a little about where you live. To find your growing zone in the US or Canada, go to this post by the Old Farmer’s Almanac. It has all the links to the maps you need to figure out your hardiness zone. Then, go to this planner. The higher the number of a zone, the more you will be able to plant. I personally garden in zone 3b. This means that my growing season is short, and any perennials I plant need to withstand -40 temperatures in winter. It also means that succession planting in the vegetable garden is next to impossible, and I have to start a lot of my heat-loving vegetables indoors or buy them from a garden centre. 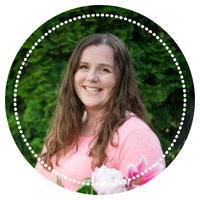 If you are feeling overwhelmed by your hardiness zone or have questions about the limitations of it, come and join me in the Growing Roots Gardening Community on Facebook, where you can get your questions answered by me and members from Canada, the United States, and Australia. 3. How Much Space and Light Do I have Available to Me? Next it’s time to get real about the size of your garden. Are you an apartment dweller with a few pots? Will you be applying for a community garden space? Do you have a sunny spot in your backyard? Are you on a farm or an acreage where you can have a garden big enough to be self-sufficient in some vegetables? Or maybe you have some combination of these situations. Whatever it is, keep this in mind as we go through the rest of the questions. Finally, you may have the physical space to set up a garden, but beware the surrounding trees and the shade they cast! Unless you live in a sunny place with extreme heat and the standard practice is to put shade cloth over your garden, the shade from outdoor buildings and mature trees can be your worst enemy–especially if you’re planting a vegetable garden or annual flowers. P.S. Planting a perennial flower shade garden? Here are some good picks! 4. How Much Time Do I Have? It happens to even the most seasoned of gardeners: you have the best of intentions in May and plant everything you can get your hands on. By July you’re sick of watering, going on vacation, and you start to get lax with the weeds and the bugs. By August you’re cursing yourself for planting so much and wondering how you’ll ever deal with all the produce. Or even worse, lamenting over your dried out and bug ridden garden. To help avoid this fate, consider what activities will be happening before you start ordering seeds. Are you having a baby? Going to a lot of weddings? Heading to the lake for three weeks in a row? Something else? 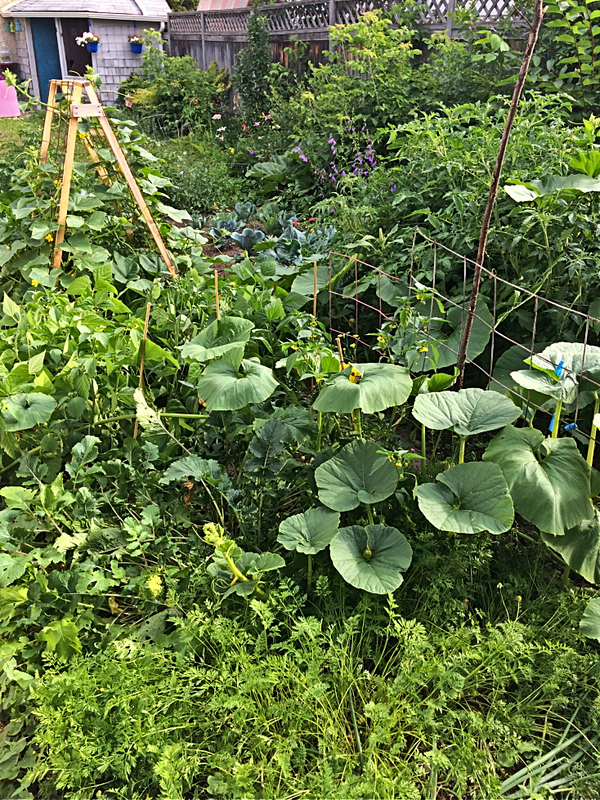 I have some strategies for keeping your garden alive during a short vacation in this post, and I talk more extensively about how to plan for longer absences in my gardening course.. 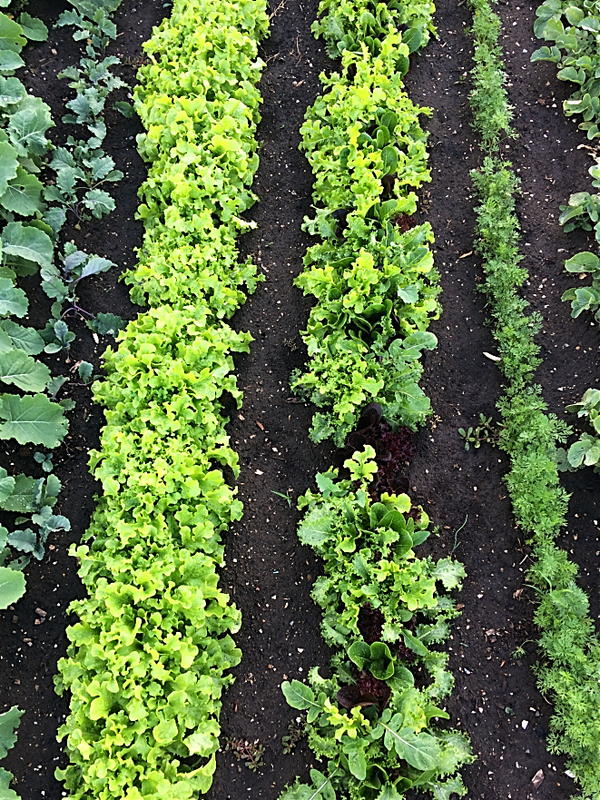 When deciding what vegetables and herbs to plant, the first question you should ask yourself is “What do I like to eat?” If you don’t like carrots and nobody in your family eats them–don’t plant carrots! 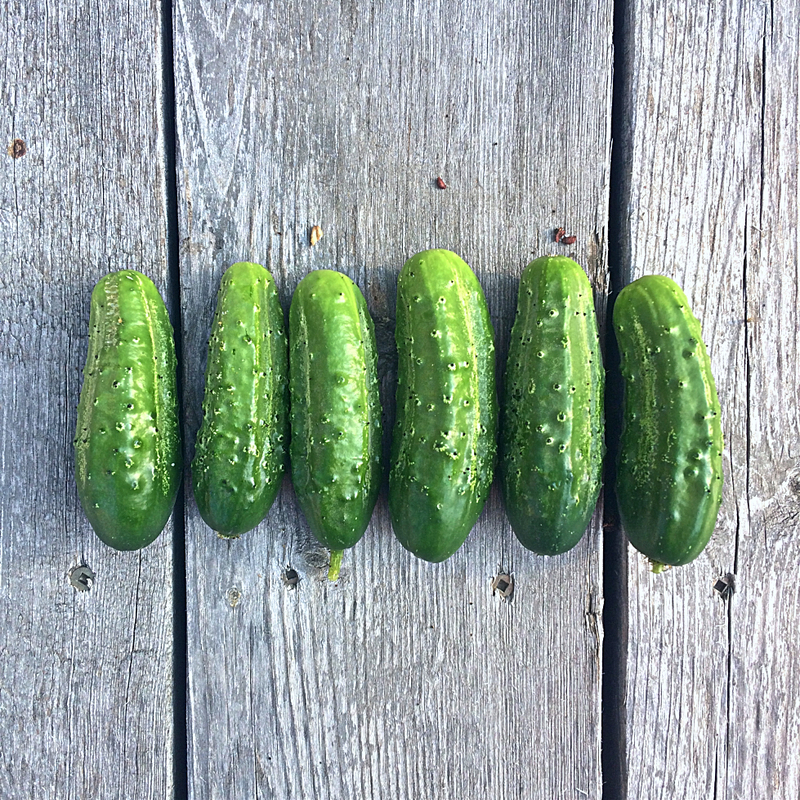 After you’ve figured out what you want to eat, choose your varieties based on the length of your growing season and whether that variety is better for fresh eating, canning, or freezing. For example, my family likes low acid tomatoes and we go through a lot of tomato sauce. Every year I plant Amana Orange and Lemon Boy to fulfill our desire for low acid tomatoes, and San Marzano, Amish Paste, or Roma tomatoes to make the best possible pasta sauce. I also tend to choose varieties of any vegetable I plant that have the shortest days to maturity possible. With a growing season that lasts only 90-100 days, I don’t have a lot of time to mess around!! 7. Am I taking on any big landscaping projects this year? While a big landscaping project might not cut into your plans if it can be done at the start or end of the growing season, the money and time you’re investing into it can leave you with a smaller budget and less time and motivation to take care of your garden. Also consider the access for the space you’re working on. For example, we’re replacing part of our fence this year, so it would be foolish to plant anything new beside the fence until the fence is fixed. Another year, I reseeded the lawn in a new place we owned and it came up nicely. However, I forgot that I was hosting an outdoor bridal shower a few weeks later, and all my fragile new grass got destroyed in one afternoon with all the guests going back and forth along the lawn. If I had just waited to reseed until after the bridal shower, I could have saved myself a lot of trouble. 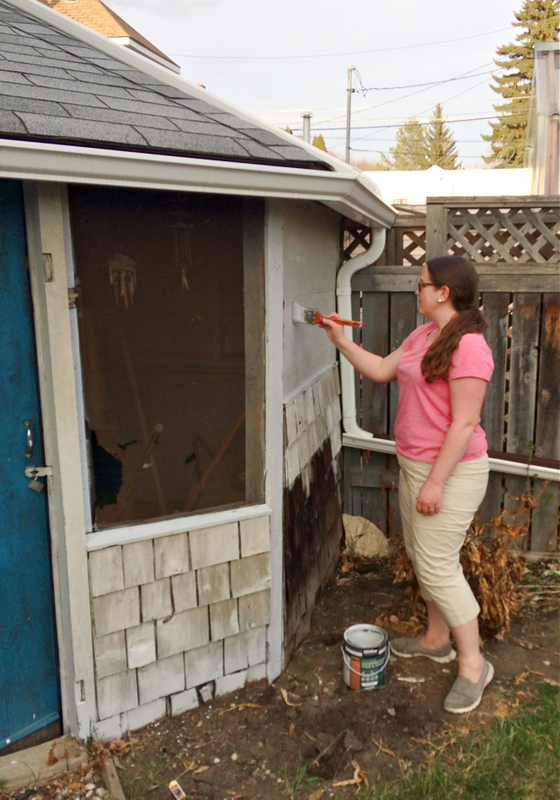 Case in point, I had to make sure I painted this shed before the perennials that grow there came up for the year. 8. What supplies do I need and where am I getting them from? This is the point in the process where you start listing out the seeds, plants, and supplies you need for your project(s) and whether you’re going to order online or in-store. Is starting seeds part of your plans? Here’s some of my favourite places to purchase seeds plus a guide for starting them from your window, or even outdoors using the winter sowing method. If you’re purchasing plants in-store, consider supporting a local greenhouse over a big-box store. There’s nothing wrong with big-box stores, however, a local greenhouse often has healthier plants, better selection, and staff who can give you actual specific advice for your garden situation. Sure, the plants might be a bit pricier, but I find the slight increase in price is offset by all the benefits listed above. Plus, my plants are less likely to die (as long as I take care of them!) so I’m not wasting money buying things twice. Planning a larger project and have no clue where to get the supplies? Big Box stores will have the basics, but for larger quantities or harder-to-find items, you’ll need to go to a larger garden centre with a landscaping division, or a landscaping store/company. Sometimes you can get supplies off of places like Kijiji or Craig’s List, but it can be hit or miss. Keep track of everything with your landscaping project over multiple years with my 5 year Backyard Planner! Get yours here. 9. What is my Budget? No one likes to talk about the budget, but it is something to consider as you’re deciding what to grow for the year. It’s super easy to spend more than you intended with every trip to the garden centre. It’s not just plants and seeds! Don’t forget about any equipment you need to replace, or extra pots, soil, or other supplies you need. Are there ways you could cut costs? 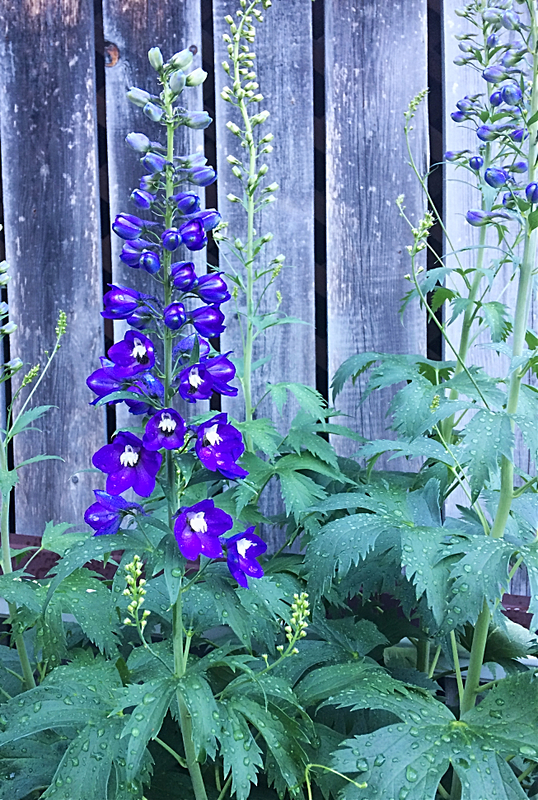 Do you know someone with an overgrown yard of perennials? Could you start buying only heirloom plants and saving the seeds? I have a couple of suggestions in these posts that can help you save money. 10. When Do I Do Everything? When you do everything is going to depend a lot on where you live, how long your growing season is, and what kind of weather you’re experiencing that year. I go into detail about this in my gardening course, but here’s a few VERY GENERAL guidelines to think about. Try to visit your garden daily to see if it needs watering or weeding. Daily maintenance is much easier than letting it pile up. The hotter the weather, the more you need to water. Pots may need to be watered 2 times a day in extreme heat. If you can’t weed a little bit every day, make a weekly date with your garden to take care of weeds. Never let it go longer than 3 weeks. Monitor any pests that are plaguing your garden and deal with them as soon as you see them. 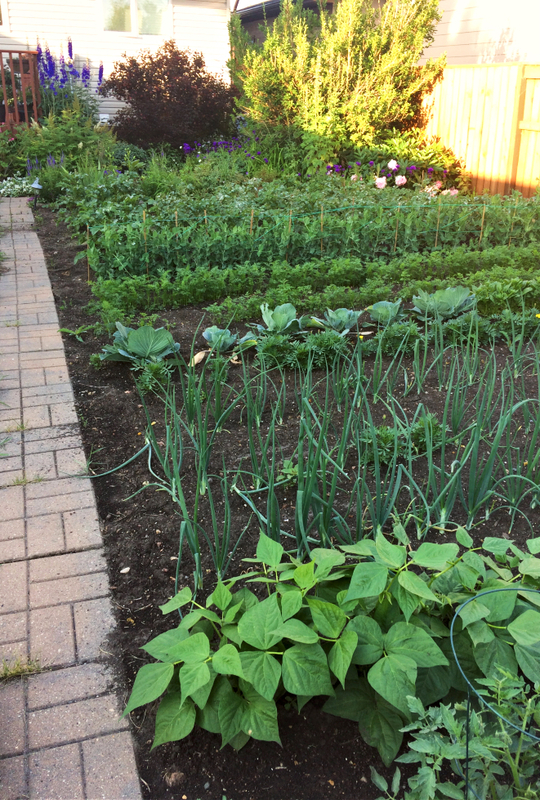 If you live someplace with a short growing season like I do, cover your vegetables or pick them green if there is a risk of frost as it gets closer to fall. Bonus: What if I Need More Help? Growing plants requires light, water, and soil, but there’s way more to it than that. 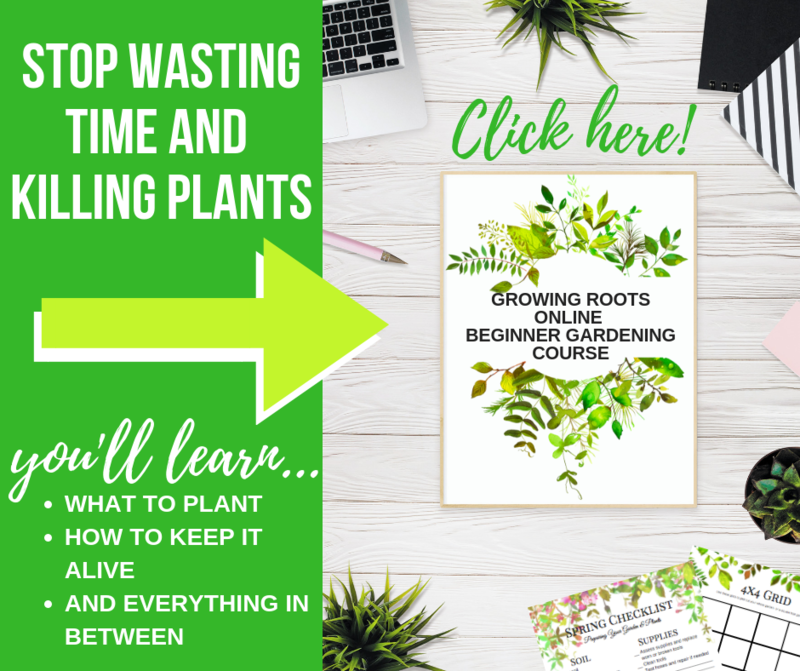 In my gardening course, I walk you through how to plan everything out, take care of it, and show you what to consider when harvesting. It’s like having a virtual me take you by the hand and explain the basics of gardening in easy to understand language. Not only that, I’ll show you what’s worth your time, what isn’t, and how to figure out how much you can handle so you don’t get overwhelmed and want to quit. Because seriously, who hasn’t wasted money on plants, only to plant them in a bad location, neglect them, and watch them turn into husks of shame? Not you my friend. Check out all the course details here for more information. Yes! I want to stop wasting time and money and start growing a beautiful garden! Don’t let another growing season pass you by. 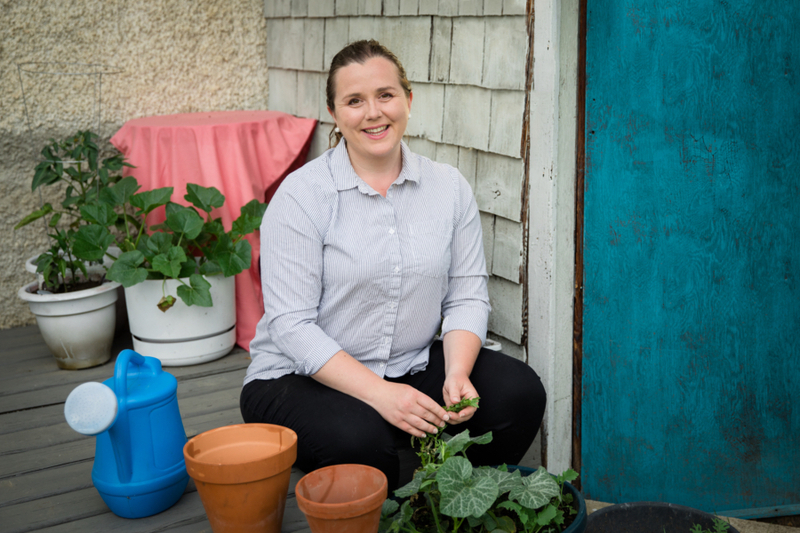 With the Growing Roots Gardening Course you can start growing delicious vegetables and herbs to feed your family, and easy flowers to beautify your yard. You’ll be able to turn your blank-slate-depressing-yard into a productive garden that brings you joy.